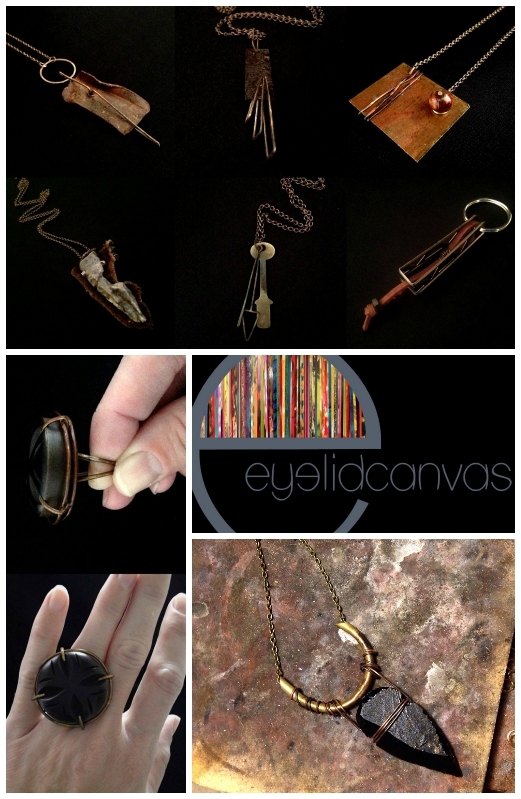 The core concept that drives eyelidcanvas is the freedom of imagination to create functional and wearable art through the clever reuse of found objects. Meet Chicago-based artist and designer Kim Schafer, the talent behind eyelidcanvas. I first saw Kim's jewelry at Remix this year and spent a long time appreciating (and photographing) her unique work. What I always hope for at events like Remix is to see something I haven't seen before. Kim's work is that "something"! So I'm thrilled to not only feature her, but also give you guys a chance to win a pendant she created especially for you! 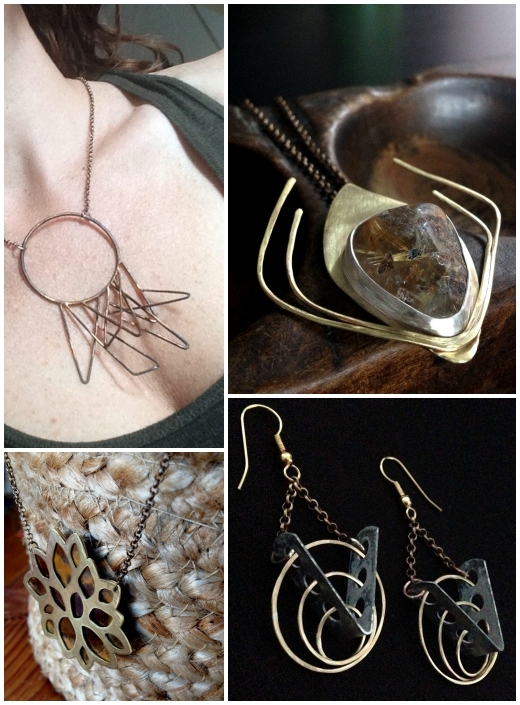 Kim's work is wearable art, much of which is created using found objects. 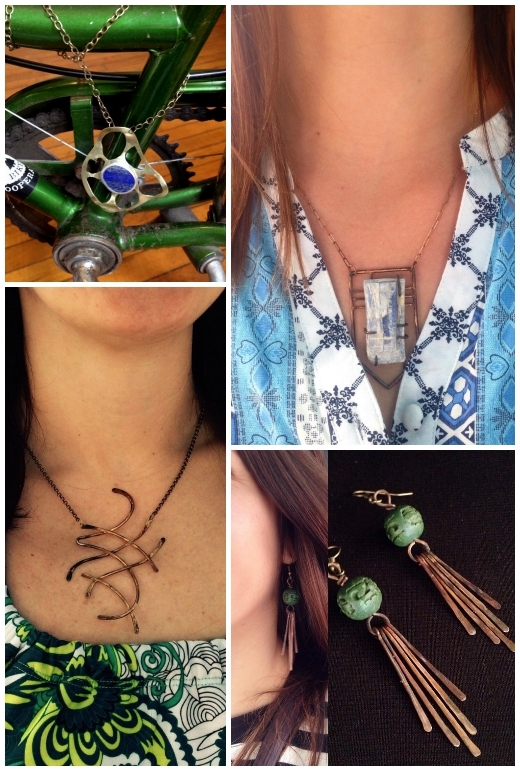 For example, she has created a whole jewelry line featuring repurposed Erector Set pieces. Her work was spotted by the Gilbert House Children's Museum (named for the inventor of the Erector Set) and she was asked to create a 40-piece collection especially for them (see examples here!). Kim's pieces also feature old hardware, rustic building materials, and interesting street finds. These items are enhanced with unexpected and original designs incorporating various metals, wire, leather, buttons and/or stones. "I sketch every day, sometimes with a stone or object in mind and I build around it, otherwise I freely sketch shapes/motifs/forms etc to recreate in wire or inspire the composition of a piece. I get ideas from everywhere around me, and am drawn to good design. I may be attracted to the curve of a lamp, the strength of a support beam, the slope in a tree leaf, the organic quality of a spill, the blunt angle of a hemline on the runway, the free form ruggedness of rust, etc. and translate that essence into a design. I use that starting point to build something that is unexpected, different, asymmetrical. So product design, architecture, nature, random acts, fashion, decay...all fair game for ideas. I love the shapes of art nouveau and art deco, but never want a piece to be identified as strictly that but rather an influence." "I very much enjoy observing how people respond to certain designs, and the comments they make about what they see in each piece. I often get feedback that my pieces have a musical vibe, and while that is not always intentional I do see it throughout my work. I have received everything from “dainty and whimsical” to “post-apocalyptic and industrial” and I love that. I think that range can be true, but my work still looks very much like my work." 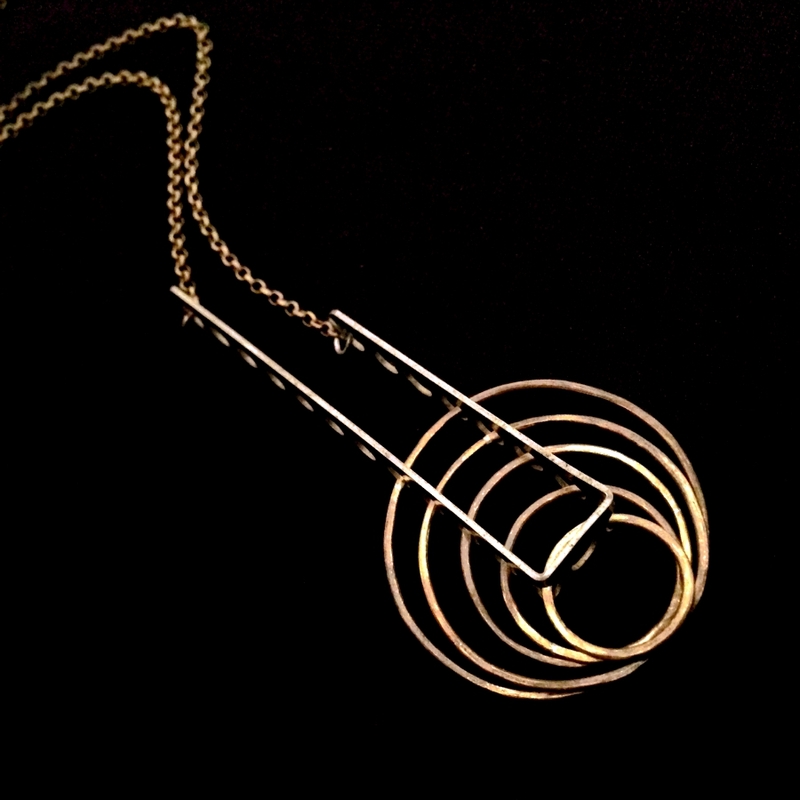 Now enter to win this lovely pendant she made for you! 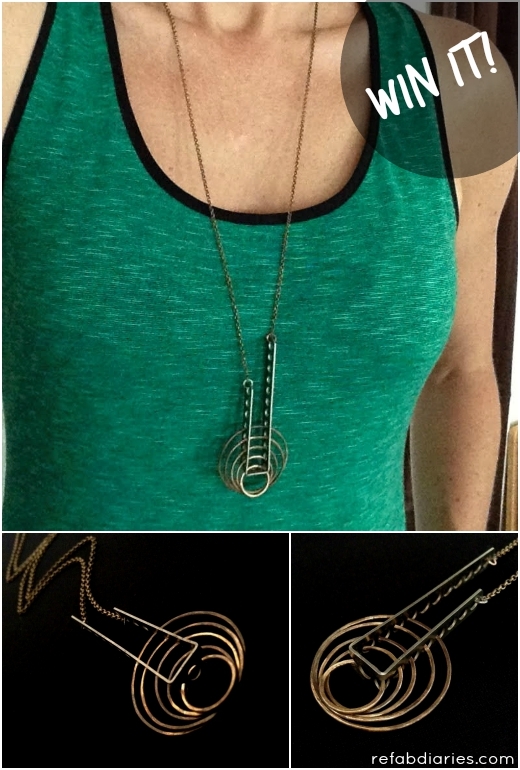 Hanging on a 30" chain, it's a wonderful combination of reuse (an Erector Set piece) and Kim's signature metalsmithing. There are lots of ways to enter (through the Rafflecopter entry below) so come back every day to up your chances. Giveaway opens 12am EST Monday, 8/10 and ends Saturday, 8/15 at midnight. WINNER announced Monday, 8/17. Open to US and Canadian residents, 18 and older. Retail value is $60.